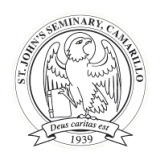 The officers of the administration are assisted by the following Seminary Standing Committees to which student representatives are elected from each class: Academic, Field Education, Spiritual Life, and Human Formation. These committees, which are composed of both faculty members and students, are primarily advisory to the various area heads. The faculty members are appointed by the Rector after consulting the respective area heads and the individuals concerned. The student members of the committee are chosen by their respective class. Membership on these committees is for one year. The purpose of these committees is to provide channels of communication between the various department heads and the faculty and students and to assist in the ongoing evaluation of all aspects of the seminary’s life in its formulation of policy and its planning for the future. Each committee elects its own secretary. The Academic Affairs Committee exercises responsibility for advising the Academic Dean regarding the overall academic program. This committee is composed of the Chairs of each academic department, the Academic Dean, the Director of Libraries, and the Fourth Year Student Representative. The Pastoral Formation Committee is composed of the Pastoral Formation Director, the Associate Director, the Administrative Assistant, three faculty members outside the Field Education Office, two intern pastor supervisors, a recently ordained SJS graduate, two field education supervisors, and a student from third and fourth theology chosen by his respective class. The purpose of this committee is to provide advice on consistent evaluation and updating of the program of Pastoral Formation and Field Education. to meet quarterly with above identified constituents. Items for the agenda of such meetings may be submitted by any member of the committee and members shall receive copies of the minutes after the meeting. The Human Formation Committee consists of the Human Formation Team and student representatives from the various levels of formation. The Committee meets monthly in order to respond to the questions and concerns raised by the seminary community and discuss ways of improving the effectiveness of the program. The members of the Committee play an integral role in the Continuous Quality Improvement of the Human Formation Program by facilitating the annual evaluation process. This committee is made up of six student representatives, one from each of the classes, together with the Director of Spiritual Formation, Associate Directors of Spiritual Formation and any other faculty members appointed by the Rector. Matters considered concern the operation of the spiritual formation program, e.g., the scheduling of retreats and days of recollection, handling of student suggestions as to content, format, location, or choice of director. The committee can be instrumental in drawing up questionnaires to explore student spiritual needs and evaluate the effectiveness of the program. Proposals with respect to policy are addressed by the Director of Spiritual Formation to the Rector and Faculty. Composed of one student representative and faculty members with the Librarian as chair, the committee makes recommendations on the programs and services of the library. It is the duty of the committee to revise and review the policies of the library as they affect the seminary community: acquisition/removal of materials, use of computers, circulation, and interlibrary loan. The committee is the vehicle for expression on how to better provide information to students/faculty.